WHO : On the face, in the depression between the superomedial parts of the inner canthus ofthe eye and the medial wall of the orbit. 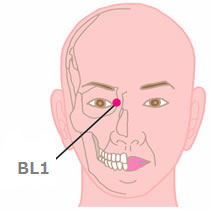 Note: When the eye is closed, BL1 is located in the depression 0.1 B-cun superior and medial to the inner canthus of the eye. WHO : On the head, in the depression at the medial end of the eyebrow. 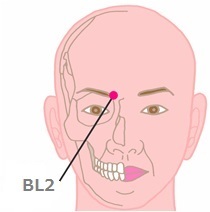 Note: A depression, the frontal notch, can often be palpated on the medial end of the eyebrow directly superior to BL1. 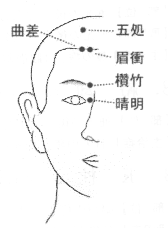 WHO : On the head, superior to the frontal notch, 0.5 B-cun superior to the anterior hairline. Note: Midway between GV24 and BL4. 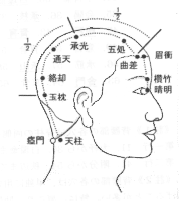 WHO : On the head, 0.5 B-cun superior to the anterior hairline, 1.5 B-cun lateral to the anterior median line. Note: At the junction of the medial one third and lateral two thirds of the line connecting GV24 with ST8. 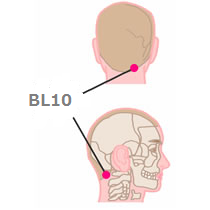 WHO : On the head, 1 B-cun superior to the anterior hairline, 1.5 B-cun lateral to the anterior median line. Note: 0.5 B-cun superior to BL4, at the same level as GV23. 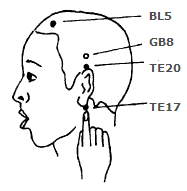 WHO : On the head, 2.5 B-cun superior to the anterior hairline, 1.5 B-cun lateral to the anterior median line. 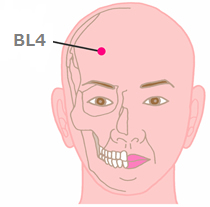 WHO : On the head, 4 B-cun superior to the anterior hairline, 1.5 B-cun lateral to the anterior median line. 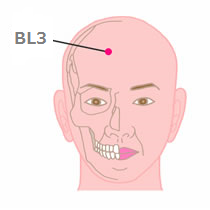 Note: Midway between BL6 and BL8. 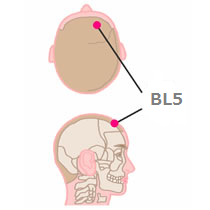 WHO : On the head, 5.5 B-cun superior to the anterior hairline, 1.5 B-cun lateral to the anterior median line. 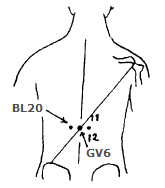 Note: 0.5 B-cun posterior and 1.5 B-cun lateral to GV20. 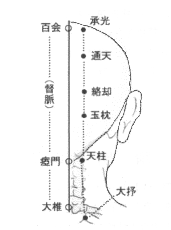 WHO : On the head, at the same level as the superior border of the external occipital protuberance, and 1.3 B-cun lateral to the posterior median line. 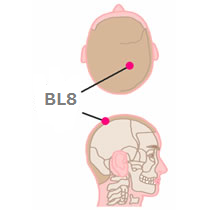 Note: BL9 is located at the intersection of two imaginary lines: the vertical line of the lateral border of the trapezius muscle and the horizontal line of the superior border of the external occipital protuberance. At the same level as GV17. WHO : In the posterior region of the neck, at the same level as the superior border of the spinous process of the second cervical vertebra (C2), in the depression lateral to the trapezius muscle. WHO : In the upper back region, at the same level as the inferior border of the spinous process of the first thoracic vertebra (T1), 1.5 B-cun lateral to the posterior median line. 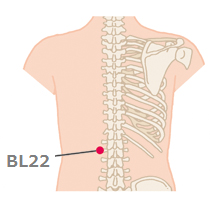 WHO : In the upper back region, at the same level as the inferior border of the spinous process of the second thoracic vertebra (T2), 1.5 Bcun lateral to the posterior median line. WHO : In the upper back region, at the same level as the inferior border of the spinous process of the third thoracic vertebra (T3), 1.5 B-cun lateral to the posterior median line. 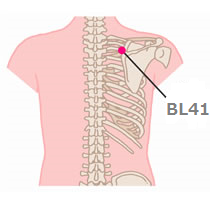 WHO : In the upper back region, at the same level as the inferior border of the spinous process of the fourth thoracic vertebra (T4), 1.5 Bcun lateral to the posterior median line. 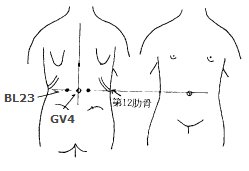 WHO : In the upper back region, at the same level as the inferior border of the spinous process of the fifth thoracic vertebra (T5), 1.5 B-cun lateral to the posterior median line. Practical : 2 fingers from GV-11. 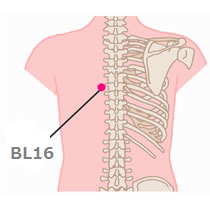 WHO : In the upper back region, level with the inferior border of the spinous process of the sixth thoracic vertebra (T6), 1.5 B-cun lateral to the posterior median line. 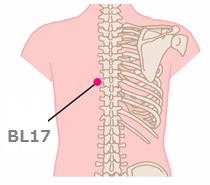 WHO : In the upper back region, at the same level as the inferior border of the spinous process of the seventh thoracic vertebra (T7), 1.5 B-cun lateral to the posterior median line. Note: The inferior angle of the scapula is at the same level as the spinous process of the seventh thoracic vertebra. Practical : 2 fingers from GV-9. 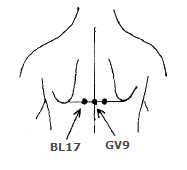 WHO : In the upper back region, at the same level as the inferior border of the spinous process of the ninth thoracic vertebra (T9), 1.5 B-cun lateral to the posterior median line. Practical : 2 fingers from GV-8. 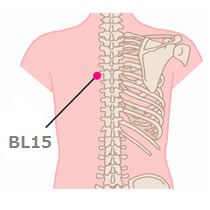 WHO : In the upper back region, at the same level as the inferior border of the spinous process of the tenth thoracic vertebra (T10), 1.5 Bcun lateral to the posterior median line. 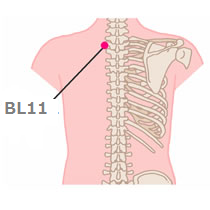 WHO : In the upper back region, at the same level as the inferior border of the spinous process of the 11th thoracic vertebra (T11), 1.5 B-cun lateral to the posterior median line. 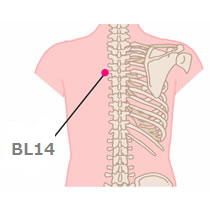 WHO : In the upper back region, at the same level as the inferior border of the spinous process of the 12th thoracic vertebra (T12), 1.5 Bcun lateral to the posterior median line. WHO : In the lumbar region, at the same level as the inferior border of the spinous process of the first lumbar vertebra (L1), 1.5 B-cun lateral to the posterior median line. 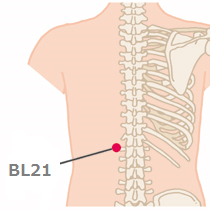 WHO : In the lumbar region, at the same level as the inferior border of the spinous process of the second lumbar vertebra (L2), 1.5 Bcun lateral to the posterior median line. Practical : 2 fingers from GV-4. GV-4 is the back side of the navel. 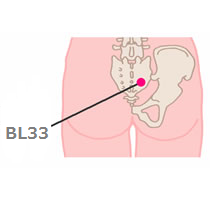 WHO : In the lumbar region, at the same level as the inferior border of the spinous process of the third lumbar vertebra (L3), 1.5 B-cun lateral to the posterior median line. 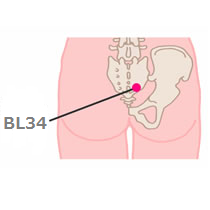 WHO : In the lumbar region, at the same level as the inferior border of the spinous process of the fourth lumbar vertebra (L4), 1.5 Bcun lateral to the posterior median line. Practical : 2 fingers from GV-3. WHO : In the lumbar region, at the same level as the inferior border of the spinous process of the fifth lumbar vertebra (L5), 1.5 B-cun lateral to the posterior median line. WHO : In the sacral region, at the same level as the first posterior sacral foramen, and 1.5 B-cun lateral to the median sacral crest. Note: At the same level as BL31. 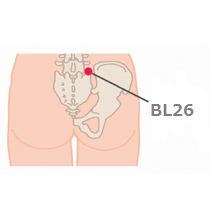 Practical : 2 fingers outside of under the first median sacral crest. WHO : In the sacral region, at the same level as the second posterior sacral foramen, and 1.5 B-cun lateral to the median sacral crest. Note: At the same level as BL32. WHO : In the sacral region, at the same level as the third posterior sacral foramen, 1.5 B-cun lateral to the median sacral crest. Note: At the same level as BL33. WHO : In the sacral region, at the same level as the fourth posterior sacral foramen, 1.5 B-cun lateral to the median sacral crest. 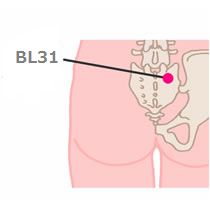 Note: 1.5 B-cun lateral to the sacral hiatus, at the same level as BL34. WHO : In the sacral region, in the first posterior sacral foramen. 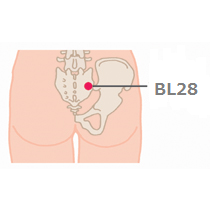 Note: The first posterior sacral foramen is palpated in the depression, moving superiorly from BL32. WHO : In the sacral region, in the second posterior sacral foramen. Note: The second posterior sacral foramen is located in the depression, midway between the posterior superior iliac spine and the spinous process of the second sacral vertebra. WHO : In the sacral region, in the third posterior sacral foramen. 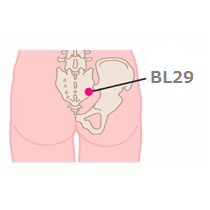 Note: The third posterior sacral foramen is located in the first depression, moving downward from BL32. WHO : In the sacral region, in the fourth posterior sacral foramen. 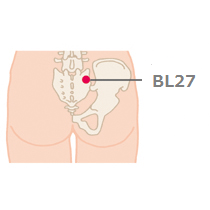 Note: The fourth posterior sacral foramen is located in the second depression, moving downward from BL32, at the same level as the sacral hiatus. 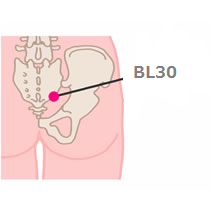 WHO : In the buttock region, 0.5 B-cun lateral to the extremity of the coccyx. Note: The subject may be in prone position or knee-chest position. 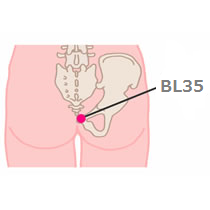 BL35 is located at the soft depression lateral to the extremity of the coccyx. 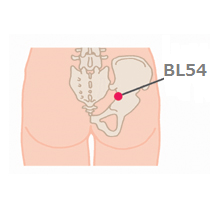 WHO : In the buttock region, at the midpoint of the gluteal fold. WHO : On the posterior aspect of the thigh, between the biceps femoris and the semitendinosus muscles, 6 B-cun inferior to the gluteal fold. Note 1: In the prone position, the semitendinosus and the biceps femoris muscles are more distinct when the knee is flexed against resistance. In addition, it is easier to find the two muscles with internal and external rotation of the hip. 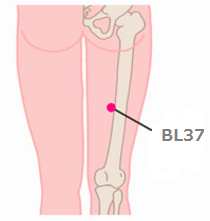 Note 2: 1 B-cun superior to the midpoint of the line connecting BL36 with BL40. WHO : On the posterior aspect of the knee, just medial to the biceps femoris tendon, 1 Bcun proximal to the popliteal crease. 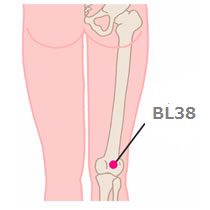 Note: With the knee in slight flexion, BL38 is located medial to the biceps femoris tendon, 1 B-cun proximal to BL39. WHO : On the posterolateral aspect of the knee, just medial to the biceps femoris tendon in the popliteal crease. Note: The biceps femoris tendon is more prominent when the knee is slightly flexed. 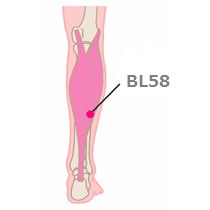 WHO : On the posterior aspect of the knee, at the midpoint of the popliteal crease. 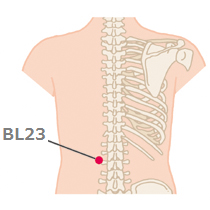 WHO : In the upper back region, at the same level as the inferior border of the spinous process of the second thoracic vertebra (T2), 3 B-cun lateral to the posterior median line. 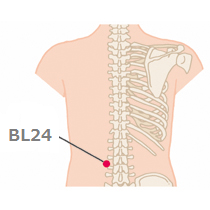 Note: BL41 and BL12 are located at the same level as the inferior border of the spinous process of the second thoracic vertebra (T2). WHO : In the upper back region, at the same level as the inferior border of the spinous process of the third thoracic vertebra (T3), 3 B-cun lateral to the posterior median line. 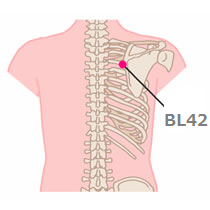 Note: BL42, BL13 and GV12 are located at the same level as the inferior border of the third thoracic vertebra (T3). 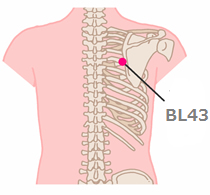 WHO : In the upper back region, at the same level as the inferior border of the spinous process of the fourth thoracic vertebra (T4), 3 B-cun lateral to the posterior median line. 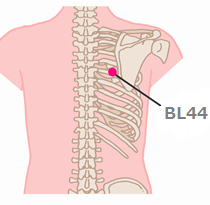 Note: BL43 and BL14 are located at the same level as the inferior border of the spinous process of the fourth thoracic vertebra (T4). 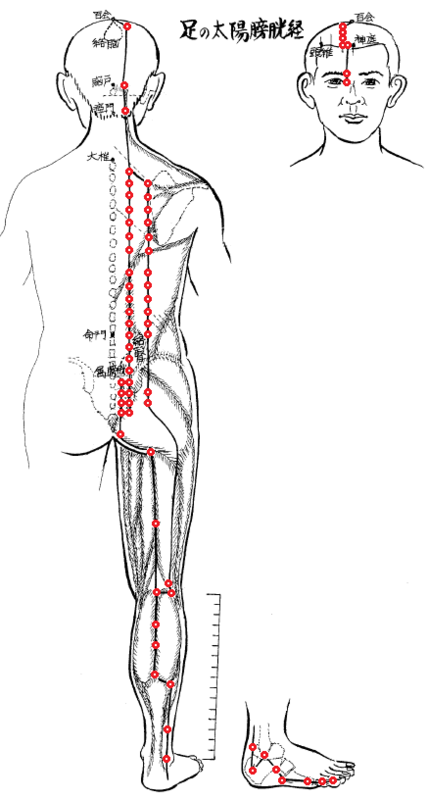 *Acu points of the back is effective when used in conjunction with the point of the other points of the back. 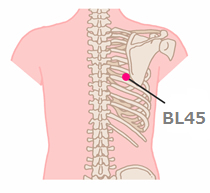 WHO : In the upper back region, at the same level as the inferior border of the spinous process of the fifth thoracic vertebra (T5), 3 B-cun lateral to the posterior median line. 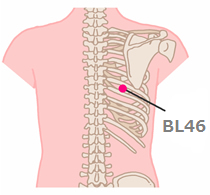 Note: BL44, BL15 and GV11 are located at the same level as the inferior border of the spinous process of the fifth thoracic vertebra (T5). 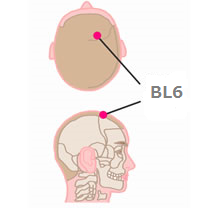 WHO : In the upper back region, at the same level as the inferior border of the spinous process of the sixth thoracic vertebra (T6), 3 B-cun lateral to the posterior median line. 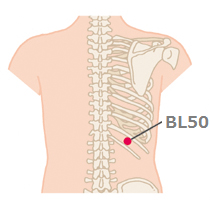 Note: BL45, BL16 and GV10 are located at the same level as the inferior border of the spinous process of the sixth thoracic vertebra (T6). 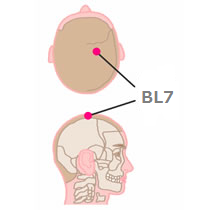 WHO : In the upper back region, at the same level as the inferior border of the spinous process of the seventh thoracic vertebra (T7), 3 B-cun lateral to the posterior median line. 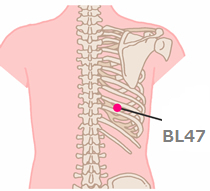 Note: BL 46, BL17 and GV9 are located at the same level as the inferior border of the spinous process of the seventh thoracic vertebra (T7). 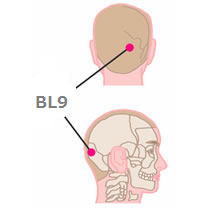 WHO : In the upper back region, at the same level as the inferior border of the spinous process of the ninth thoracic vertebra (T9), 3 B-cun lateral to the posterior median line. 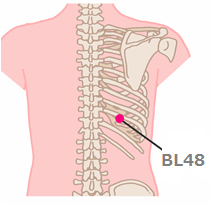 Note: BL47, BL18 and GV8 are located at the same level as the inferior border of the spinous process of the ninth thoracic vertebra (T9). 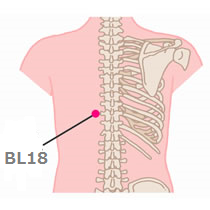 WHO : In the upper back region, at the same level as the inferior border of the spinous process of the tenth thoracic vertebra (T10), 3 B-cun lateral to the posterior median line. 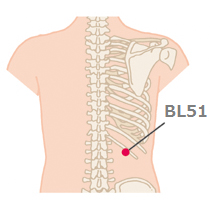 Note: BL48, BL19 and GV7 are located at the same level as the inferior border of the spinous process of the tenth thoracic vertebra (T10). 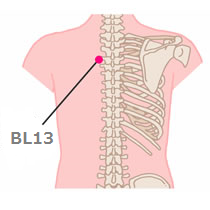 WHO : In the upper back region, at the same level as the inferior border of the spinous process of the 11th thoracic vertebra (T11), 3 B-cun lateral to the posterior median line. 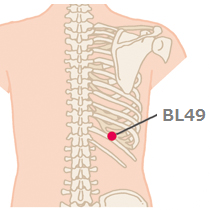 Note: BL49, BL20 and GV6 are located at the same level as the inferior border of thespinous process of the 11th thoracic vertebra (T11). 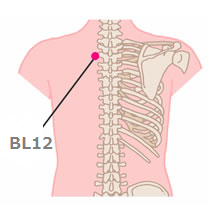 WHO : In the upper back region, at the same level as the inferior border of the spinous process of the 12th thoracic vertebra (T12), 3 B-cun lateral to the posterior median line. 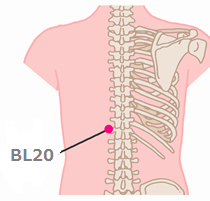 Note: BL50 and BL21 are located at the same level as the inferior border of the spinous process of the 12th thoracic vertebra (T12). 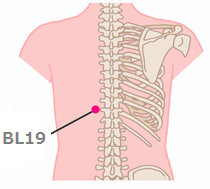 WHO : In the lumbar region, at the same level as the inferior border of the spinous process of the first lumbar vertebra (L1), 3 B-cun lateral to the posterior median line. 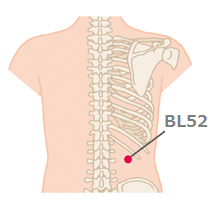 Note: BL51, BL22 and GV5 are located at the same level as the inferior border of the spinous process of the first lumbar vertebra (L1). WHO : In the lumbar region, at the same level as the inferior border of the spinous process of the second lumbar vertebra (L2), 3 Bcun lateral to the posterior median line. 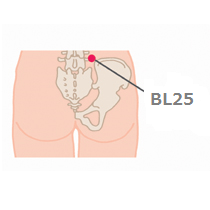 Note: BL52, BL23 and GV4 are located at the same level as the inferior border of the spinous process of the second lumbar vertebra (L2). WHO : In the buttock region, at the same level as the second posterior sacral foramen, 3 Bcun lateral to the median sacral crest. 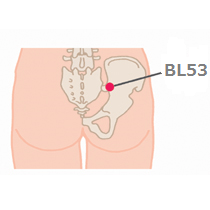 Note: BL53, BL28 and BL32 are located at the same level as the second posterior sacral foramen. WHO : In the buttock region, at the same level as the fourth posterior sacral foramen, 3 Bcun lateral to the median sacral crest. 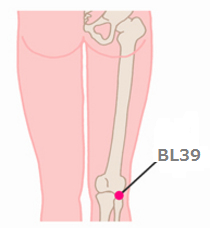 Note: 3 B-cun lateral to the sacral hiatus, at the same level as BL 30.
WHO : On the posterior aspect of the leg, between the lateral head and medial head of the gastrocnemius muscle, 2 B-cun distal to the popliteal crease. 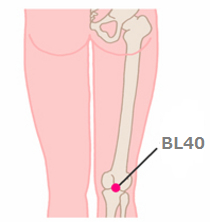 Note: 2 B-cun distal to BL40, on the line connecting BL40 with BL57. 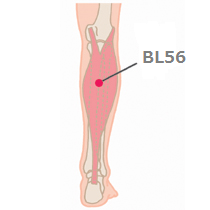 WHO : On the posterior aspect of the leg, between the two muscle bellies of the gastrocnemius muscle, 5 B-cun distal to the popliteal crease. Note: Midway between BL55 and BL57. WHO : On the posterior aspect of the leg, at the connecting point of the calcaneal tendon with the two muscle bellies of the gastrocnemius muscle. 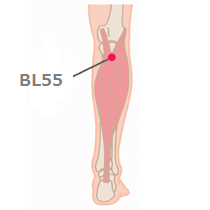 Note: With the leg stretched (plantar flexion) or the heel up, BL57 is located at the sharp angled depression inferior to the muscle belly of the gastrocnemius muscle. The two heads of the gastrocnemius muscle are separated to make a lambda shape (Λ). 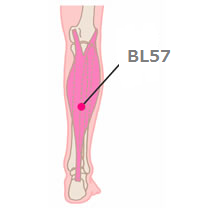 WHO : On the posterolateral aspect of the leg, between the inferior border of the lateral head of the gastrocnemius muscle and the calcaneal tendon, at the same level as 7 Bcun proximal to BL60. 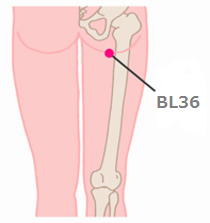 Note: BL58 is located 1 B-cun lateral and distal to BL57, proximal to BL60. 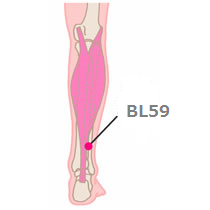 WHO : On the posterolateral aspect of the leg, between the fibula and the calcaneal tendon, at the same level as 3 B-cun proximal to BL60. WHO : On the posterolateral aspect of the ankle, in the depression between the prominence of the lateral malleolus and the calcaneal tendon. 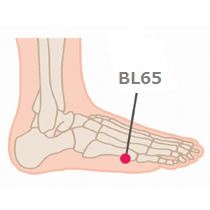 WHO : On the lateral aspect of the foot, distal to BL60, lateral to the calcaneus, at the border between the red and white flesh. 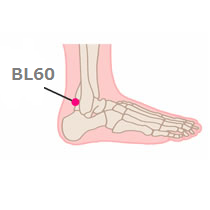 WHO : On the lateral aspect of the foot, directly inferior to the prominence of the lateral malleolus, in the depression between the inferior border of the lateral malleolus and the calcaneus. 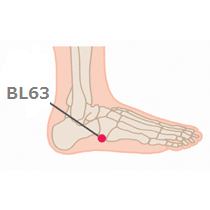 Note: BL62 is located in the depression distal to the inferior border of the lateral malleolus. 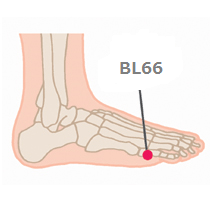 The corresponding medial acupuncture point to BL 62 is KI6. WHO : On the dorsum of the foot, distal to the anterior border of the lateral malleolus, posterior to the tuberosity of the fifth metatarsal bone, in the depression inferior to the cuboid bone. 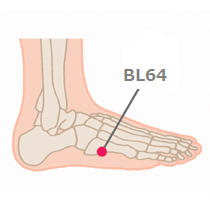 WHO : On the lateral aspect of the foot, distal to the tuberosity of the fifth metatarsal bone, at the border between the red and white flesh. 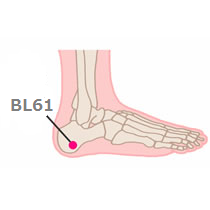 Note: The tuberosity of the fifth metatarsal bone is located approximately midway between the heel and the fifth metatarsophalangeal joint. 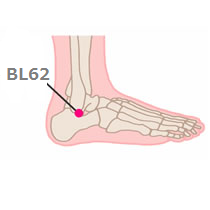 WHO : On the lateral aspect of the foot, in the depression proximal to the fifth metatarsophalangeal joint, at the border between the red and white flesh. 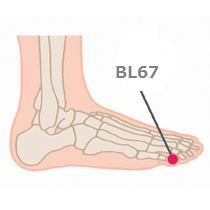 WHO : On the little toe, in the depression distal and lateral to the fifth metatarsophalangeal joint, at the border between the red and white flesh. WHO : On the little toe, lateral to the distal phalanx, 0.1 F-cun proximal to the lateral corner of the toenail; at the intersection of the vertical line of the lateral side of the nail and the horizontal line of the base of the toenail.